After fixing a failed SSD of one of my lab-hosts I had some minor issues with my vCenter. Whenever I logged on into it I received this error. fair enough I checked the :5480 VAMI of my PSC and vCenter and the vCenter showed me the SSO was not initialized. BUUUUT, I figured out that this message is completly ok as long as you are having a distributed installation with a dedicated Platform Service Controller (PSC) virtual machine. –> Let’s grab some log-files of the webclient. So what was the problem. My ESXi host had some time-differences within each other based on a longer-outage I had within my home-lab. When I replaced my SSD I did not adjusted my bios-clock and therefore my repaired ESXi host did not match the others. Now the chain reaction takes place. In my lab-environment the vCSA (vCenter and PSC) take their time via VMware-tools based on the ESXi host clock. 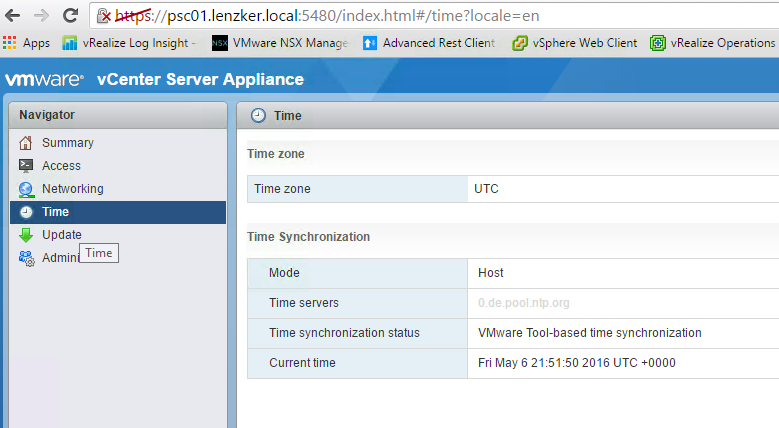 So verify your ESXi host are having the correct time –> Make sure you have vCSA time-sync configured via NTP or VMware tools and verify the correct settings via the VAMI. you are absolutely right. in my case my psc and vcsa were out of time sync. I synced the time and voila! it’s up again. Just pointing out a type. It should be 600 Secs or 10 minutes for 600000 ms, isnt it? Thanks for the tip. This was exactly my problem!